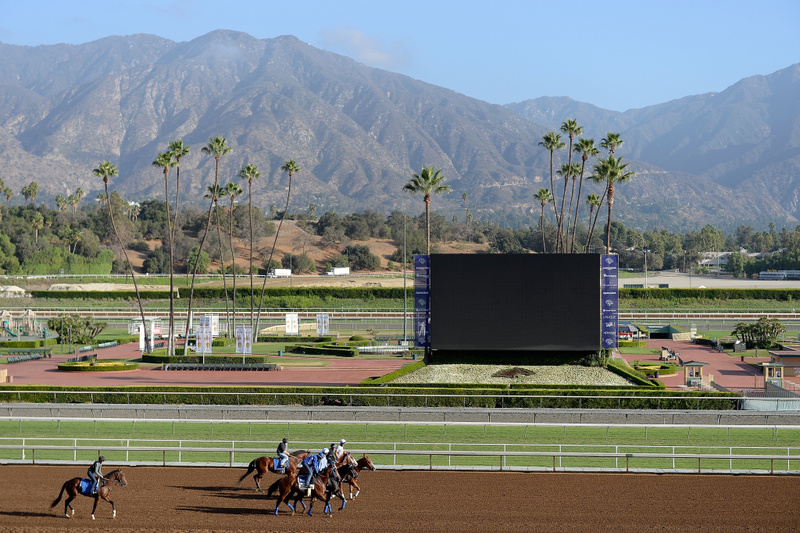 Horses are led to the track to train in preparation for the 2014 Breeder's Cup at Santa Anita Park on October 27, 2014 in Arcadia, California. The Los Angeles County District Attorney's Office has launched an investigation into the spate of horse deaths at Santa Anita Park, less than a week after Santa Anita Park announced that it will take historic steps to tighten their use on horse whips and medication. The move was announced in an open letter last Thursday by Stronach Group’s chairman and president, Belinda Stronach, after the death of a 22nd horse at Santa Anita since its opening day on Dec. 26. According to the Pasadena Star-News, roughly 50 horses die per year at the “Great Race Place,” making the Arcadia racetrack one of the deadliest in the state. Both the Southern and Northern California Thoroughbred racetracks will be the first in North America to follow strict International Federation of Horseracing Authorities(IFHA) standards. What’s caused the unusual spate in horse deaths, and what does this mean for the horse racing community? Call us with your questions and reactions at 866-893-5722 or comment below.